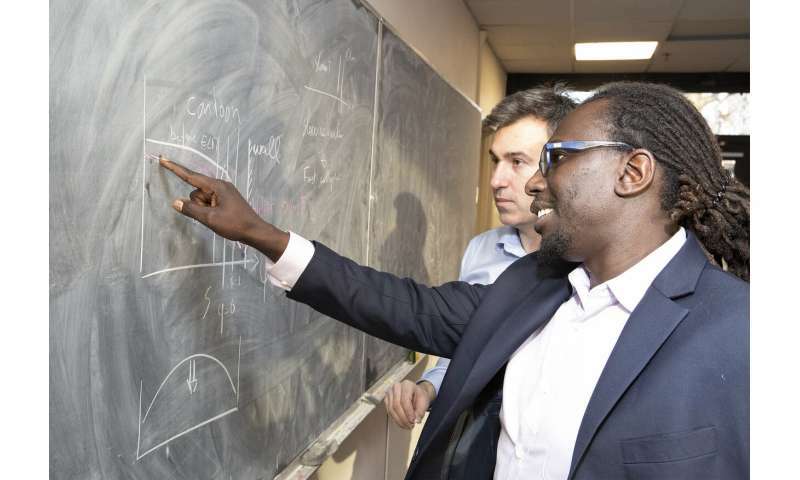 Physicists Ahmed Diallo, front, and Julien Dominski. Credit: Elle Starkman/PPPL Office of Communications. Sudden bursts of heat that can damage the inner walls of tokamak fusion experiments are a hurdle that operators of the facilities must overcome. Such bursts, called "edge localized modes (ELMs)," occur in doughnut-shaped tokamak devices that house the hot, charged plasma that is used to replicate on Earth the power that drives the sun and other stars. Now researchers at the U.S. Department of Energy's (DOE) Princeton Plasma Physics Laboratory (PPPL) have directly observed a possible and previously unknown process that can trigger damaging ELMs. 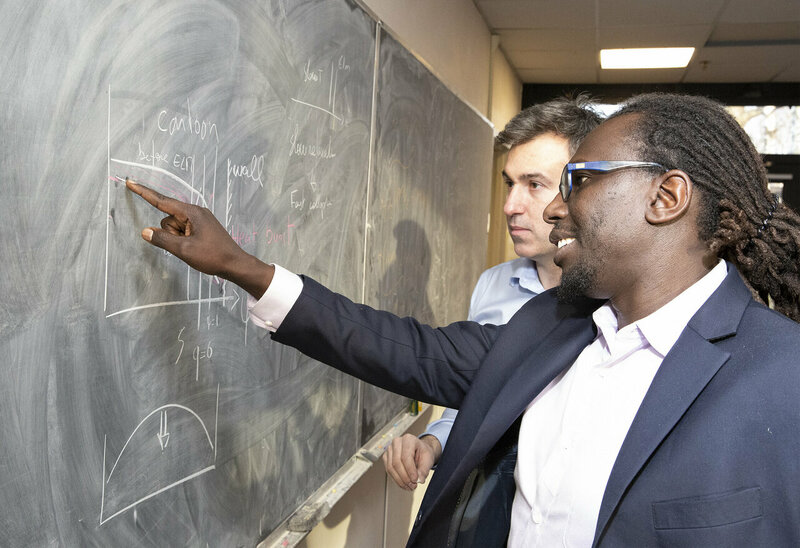 Working together, physicists Ahmed Diallo, an experimentalist, and Julien Dominski, a theorist, pieced together data from the DIII-D National Fusion Facility that General Atomics operates for the DOE in San Diego, to uncover a trigger for a particular type of ELM that does not fit into present models of ELM plasma destabilization. Their findings could shed light on the variety of mechanisms leading to the onset of ELMs and could broaden the portfolio of ELM suppression tools. Understanding ELM physics is crucial to developing fusion facilities that can fuse light elements in the form of plasma—the state of matter composed of free electrons and atomic nuclei—to produce a virtually inexhaustible supply of energy to generate electricity. The new observations, reported in Physical Review Letters, began as an effort to unravel puzzling data detected by probes of magnetic field and plasma density fluctuations during DIII-D experiments. The data showed the eruption of ELMs following periods of unusual quiescence. "These were special cases that didn't follow a standard model," said Diallo. "We started digging into this together," Dominski said. "It was a most interesting collaboration." In roughly six months of joint research, the physicists uncovered previously unseen correlations of fluctuations in the DIII-D experiments. These correlations revealed the formation of two modes—or waves—at the edge of the plasma that coupled together to generate a third mode. The newcomer then moved toward the wall of the tokamak—created a radial distortion in technical terms—that triggered bursts of low-frequency ELMs. The ELMs were a type also seen on the Joint European Torus (JET) in the United Kingdom, the ASDEX Upgrade in Germany and other fusion devices following periods of quiescence. In principle, the results could also apply to systems such as solar flares and geomagnetic storms that are suddenly unleashed, according to the paper. While the findings open a door on a method for triggering ELMs, they do not fully explain the process. The two physicists thus seek to analyze more data sets. "If we can fully understand how the triggering works we can block and reverse it," Diallo said.